From New Haven Area, take I-95 to EXIT 57. Take right onto Route 1. Follow Route 1 to the intersection of Church Street (Rte. 77) and Route 1. Take a right onto Church Street (Rte. 77). At Stop Sign take a right onto Broad Street then an immediate left onto Whitfield Street. Continue about 1 mile and take a left at fork onto Old Whitfield Street, then another left onto Stone House Lane to Fairgrounds entrance. EXIT 58 Turn right onto Church Street (Rte. 77). Continue across Route 1. At the Stop Sign take a right onto Broad Street then an immediate left onto Whitfield Street. Continue about 1 mile and take a left at fork onto Old Whitfield Street, then another left onto Stone House Lane to Fairgrounds entrance. From New London Area, take EXIT 59 (Goose Lane). Take a right onto Goose Lane, cross over Route 1. At Stop Sign take a right onto Boston Street. Continue about a mile and take a left onto South Union Street. Continue to end and turn right onto Stone House Lane to the Fairgrounds entrance. FREE Shuttle Bus Lots will be at EXIT 57. 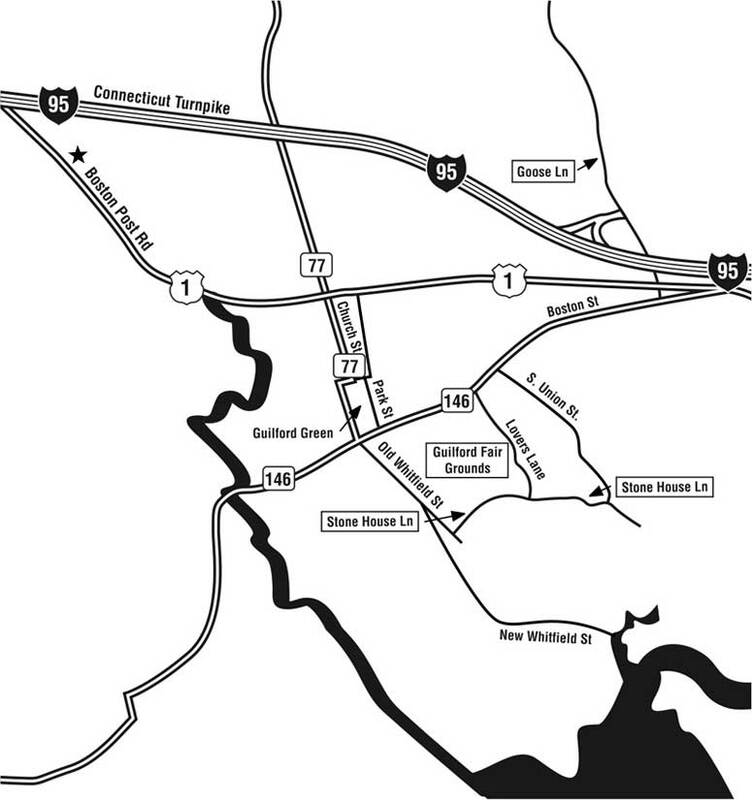 Entrance for General Parking during the Fair is located on Stonehouse Lane near Lovers Lane in Guilford, CT.